Media previews for Red Letters from The Province and The Straight. It's a busy week for Asian-Canadian Theatre. Jade in the Coal opened Thursday Nov 25th, and Red Letters opened on Friday Nov 26th. Both feature music and are set during an important time of Chinese-Canadian history. This entry was posted in Main Page on November 28, 2010 by Todd. I first met Joy Kogawa when she gave a reading at Expo 86. It was soon after her first novel Obasan was published, and it would still be 2 more years until Japanese Canadians received Parliamentary Redress for the internment and confiscation of their properties during WW2. 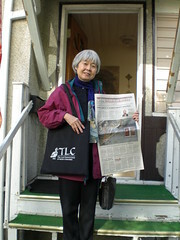 I got to know Joy during the 2005 One Book One Vancouver program that featured Obasan, as the book for all Vancouverites to read. By September, I was drawn into a lead role for the Save Kogawa House campaign, as her childhood home became threatened with an application for demolition. In a few short weeks, together with Ann-Marie Metten in Vancouver and Anton Wagner in Toronto, we mobilized our communities and brought attention to the threat to Joy's childhood home, started a fundraising campaign, and received lots of community and media attention. The Land Conservancy of BC stepped in to help purchase and finance the house, and today I am the President of the Historic Joy Kogawa House Society and director on the board for The Land Conservancy of BC. Here's the Vancouver Sun story. and of the Order of British Columbia. This entry was posted in Joy Kogawa & Kogawa House, Main Page on November 26, 2010 by Todd. 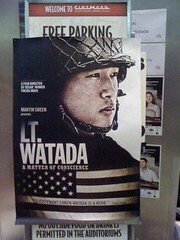 Vancouver Asian Canadian Theatre is doing their part to contribute to the Canadian theatre repertoire. Red Letters is an original musical about love, family, history and tragedy. The story spans decades, continents and generations. It is also set during Canada's pre-multicultural age, when Canada had a discriminatory head tax against any person of Chinese ancestry, which forcibly kept families apart. I was fortunate to see the stage reading, while the musical was still in development. 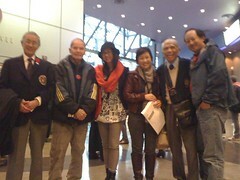 Producer Joyce Lam had assembled a very talented collection of actors to help workshop the work. The music was lyrical and soaring. Kathy Leung wrote the book, and had interviewed many people whose lives and families were affected by the head tax, and crafted a story which Alan Bau has set to music and song. I am looking forward to seeing the full production of Red Letters, which will run ambitiously in Vancouver, Richmond and Victoria. If VACT's production of Flower Drum Song set their standard of excellence, then you will want to bring your friends and see this show! 25TH ANNUAL PUTNAM COUNTY SPELLING BEE. population to enjoy English-speaking theatre. This entry was posted in Asian Canadian Cultural Events, Canadian Identity & Heritage, Chinese Canadian History, Chinese Head Tax issues + Gim Wong's Ride for Redress, Main Page, Multicultural events, Upcoming Events, Vancouver Heritage and History on November 26, 2010 by Todd. 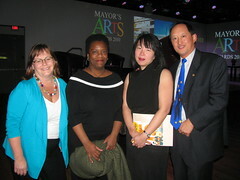 Mayor's Arts Awards celebrate Evelyn Lau and Alvin Tolentino in Literary and Dance categories! 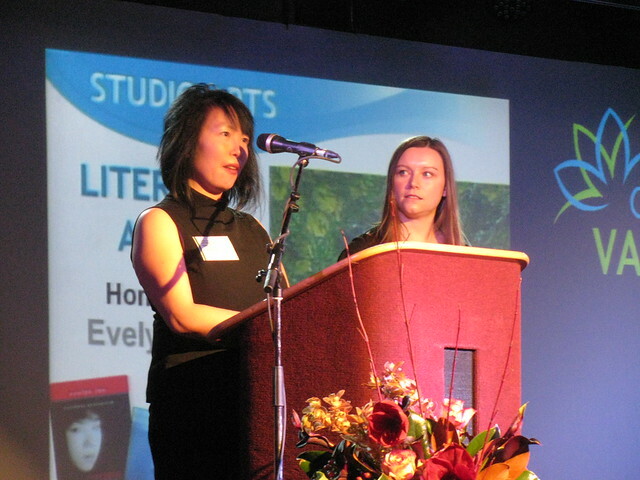 Evelyn Lau, Literary Arts Honouree speaks at the City of Vancouver 2010 Mayor's Arts Awards. 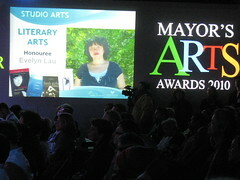 Her choice of emerging Artist was writer Kaitlyn Fontana – whom Lau had only met in person the night of the awards. Previously Lau and Fontana communicated by email only, as Lau had given literary feedback to Fontana. 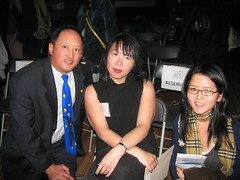 After the awards ceremony, Lau was congratulated by Todd Wong and Patricia Lim, managing editor of Ricepaper Magazine. 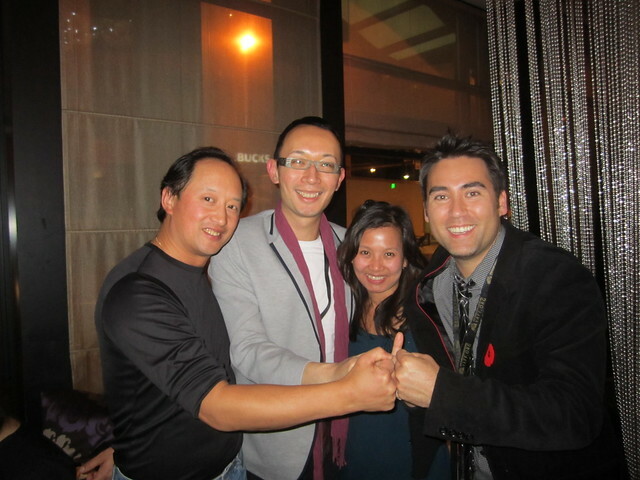 Lau has contributed to Ricepaper Magazine many times and is featured in the just-released 15th Anniversary edition. Wong is a main organizer of the 15th Anniversary Gala Dinner which will feature Lau as an award recipient for the ACWW Community Builder Award, on December 11th. 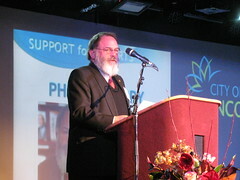 Bill Richardson hosted the Mayor's Arts Awards, that were held at 560 Club, the former site of the now defunct A&B Sound record and stereo store. Dustin Rivers gave an eloquent speech in his native Squamish language. 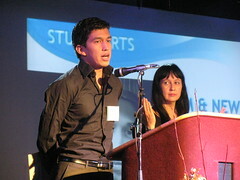 He was the Emerging Artist chosen by Cease Wyss, the honouree for the Film and New Media Award. 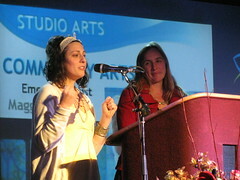 Community Arts Honouree Carmen Rosen (right) smiles fondly at Maggie Winston, her choice for Emerging Artist. I have known Carmen since 2005, when she performed at the Gung Haggis Fat Choy Dinner as a Celtic musician. Carmen is the organizer of the Moon Festival held each year at the Renfrew Ravine. She can also be found walking on stilts for other festivals such as Winter Solstice and Chinese New Year Festivals. 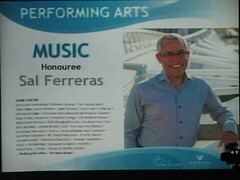 Sal Ferreras is the Music Award Honouree. He chose Evan Arntzen as Emerging Artist. Sal is an incredible teacher of music at UBC, as well as a percussionist. He really knows no cultural boundaries when performing music with musicians of many cultures and disciplines. 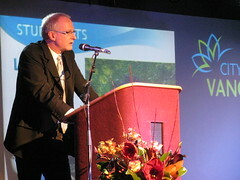 The walls of the club were used as back drops for the projections announcing each award winner. 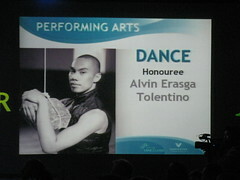 Dance Award Honouree Alvin Erasga Tolentino chose Sujit Vaidya as Emerging Artist, describing the young Indian Classical Dancer with much enthusiasm. I have known Alvin for about 10 years, and have watched many of his performances at the Firehall Arts Centre, the Roundhouse and Vancouver East Cultural Centre. Philanthropist Award recipient is Yosef Wosk, whom I first met many years ago at a board meeting for the Vancouver Public Library. Very appropriate, since Yosef loves libraries – one of his current projects is helping to develop libraries in developing countries. He is also the creator of SFU's Philosophy Cafes, which I helped program and co-host in 2003 for Vancouver Asian Heritage Month. Three Vancouver City workers with author Evelyn Lau: City Councilor Heather Deal, who handles the arts portfolio on council; Cultural Services worker Claudia who had helped to set up the Mayor's Arts Awards along with many other events last week; libary worker Todd Wong who has helped to set up programs for Vancouver libraries in his roles with Asian Canadian Writers' Workshop, such as the inaugural One Book One Vancouver program. Evelyn has told me that she would like to work at the library. I think that Evelyn should be the library's next writer-in-residence. 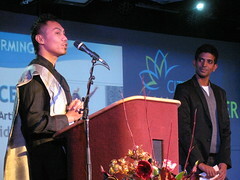 This entry was posted in Asian Canadian Cultural Events, Cultural Fusion, Literary Events, Main Page, Multicultural events, Music, Theatre, Visual Art and related events on November 25, 2010 by Todd. Paul Yee launches his new children's fiction novel: Blood and Iron – part of the “I Am Canada” young readers series from Scholastic. I Am Canada: Blood and Iron, Heen, is written as a diary of a young Chinese teen who comes to Canada with his father to help build the CPR railway in the Fraser Canyon. available for sale by Sitka Books & Art. This is a fun easy read, which I quickly read over a few days. The story is gripping and gives lots of information to the building of the CPR. 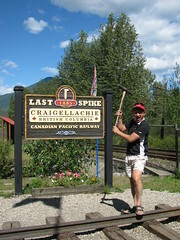 It made my summer time visit to Craigellachie, site of the Last Spike, even more insightful as I found information about the Chinese labourers not in the gift shop and book store, but only on pictures posted on the side of the building. Racism is addressed in this book in a matter of fact educational manner. It is funny to have the Scottish rail workers called “Red Beards”. 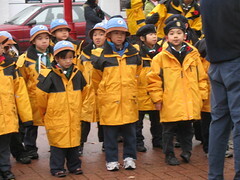 This entry was posted in Asian Canadian Cultural Events, Canadian Identity, Canadian Identity & Heritage, Chinese Canadian History, Literary Events, Main Page, Multicultural events, Upcoming Events, Vancouver Heritage and History on November 18, 2010 by Todd. 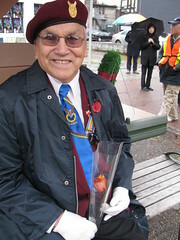 Louis is an aboriginal veteran, and he always comes to stand with his friends in Pacific Unit 280, for the Chinatown Remembrance Day ceremonies at the Canadian Chinese Pioneer Monument at Keefer Triangle. 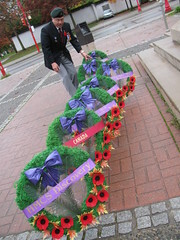 Albert Woo lines up the wreaths in order of presentation. The numbers of smaller each year for the members of Pacific Unit 280 each year. Little Beavers attend the ceremony, but were too small to see anything going on, as the crowds were large and tightly compressed around the monument. 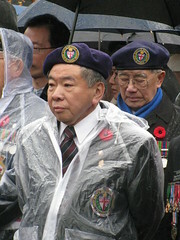 Alec Louie, the main subject of the NFB documentary Unwanted Soldiers, directed by his daughter Jari Osbourne. On his left side is Robert Kent. 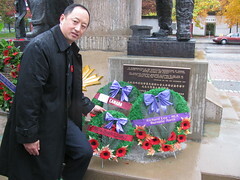 Larry Wong, curator for Chinese Canadian Military Museum. Larry has been a friend for many years, as we were both on the inaugural One Book One Vancouver committee for his friend Wayson Choy's “The Jade Peony”. 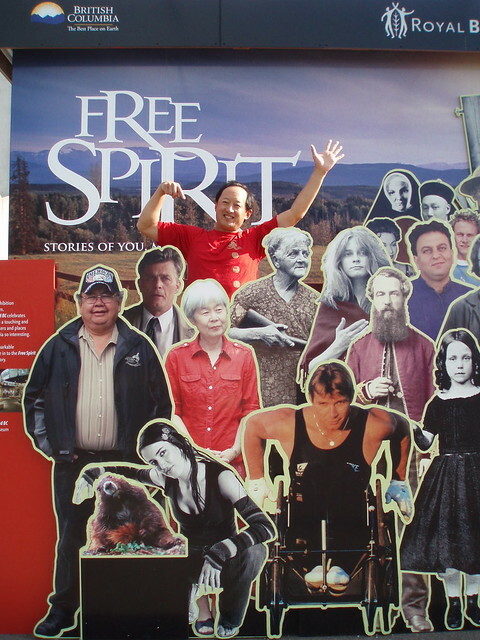 Larry is also a playwright, writer and served on many organizations including Chinese Canadian Historical Soceity, Vancouver Historical Society, and now our Friends of Foo's Ho Ho Committee. Here I am, laying the wreath for Rev. Chan Legacy. I am the 5th generation, the great-great grandson of Rev. 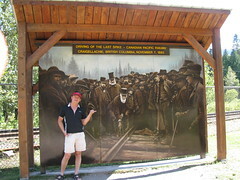 Chan Yu Tan, who came to Canada in 1896. 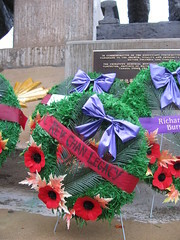 Wreath for the Rev. Chan Legacy…. Four grandsons of Rev. Chan Yu Tan went to war during WW2. 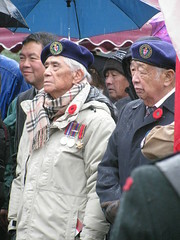 Three sons of his daughter Kate – Daniel, Howard and Leonard Lee, of Vancouver + Victor Wong of Victoria, by his daughter Rose. Unfortunately Daniel passed away earlier this January. He always played major organizing roles for both Victory Square and Chinatown services. 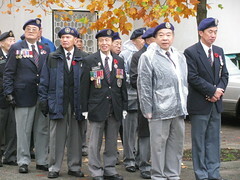 Victor leads the Chinese Canadian Veterans Association in Victoria. Leonard lives in Toronto. Howard passed on during the '70's. 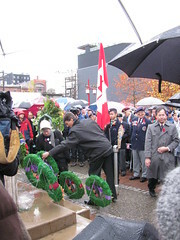 Wreath being laid for City of Vancouver, by Mayor Gregor Robertson and Councilor Ellen Woodsworth. 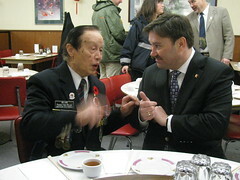 Ed Lee and Don Davies, MP for Vancouver Kingsway. Ed is telling stories to Don, for each of his medals. This entry was posted in Main Page on November 12, 2010 by Todd. 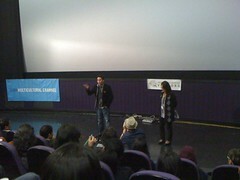 VAFF closes out with a Big Hapa feeling! mean there was something wrong with the war in Iraq.” – This film screened on Saturday. The buzz was big for the fully-packed theatre closing night screening of One Big Hapa Family, preceded by a short film titled Ode to a Post-It Note, celebrating the 30th Anniversary of the 3M invention. This entry was posted in Asian Canadian Cultural Events, Canadian Identity, Canadian Identity & Heritage, Chinese Head Tax issues + Gim Wong's Ride for Redress, Cultural Fusion, Hapa culture, Main Page, Multicultural events, Recent Reviews, Vancouver Heritage and History, Visual Art and related events on November 9, 2010 by Todd. It's always great to attend a community event and see Mable Elmore MLA for Vancouver Kensington. But Friday Night at Tinseltown Cinemas was special because it was about her partner Angelina Cantado. 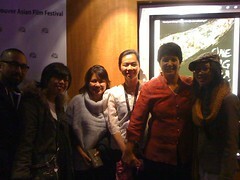 Cantado's short film SIKAT was part of a program of Phillipine-North American made movies. 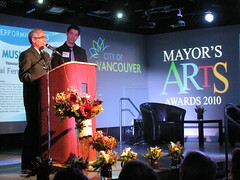 This entry was posted in Asian Canadian Cultural Events, Main Page, Multicultural events, Visual Art and related events on November 7, 2010 by Todd. Haggis Fat Choy Robbie Burns Chinese New Year Dinner. tickets in advance – as it should be a sell-out! Post-it Note decides on Father’s Day to search for its roots. Channel, Movie Central, Air Canada and Movieola. approaching the end of multiculturalism as we know it. incredible journey of self-discovery to find its ‘father’. This entry was posted in Asian Canadian Cultural Events, Canadian Identity, Canadian Identity & Heritage, Cultural Fusion, Hapa culture, Main Page, Multicultural events, Scottish, Gaelic, Irish Celtic events and stories, Upcoming Events, Visual Art and related events on November 7, 2010 by Todd. 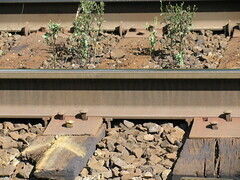 the doorstop,” said railway historian Brad Lee, … Mr.
long Chinese head tax and exclusion redress efforts. (1885-1947) for the Chinese in Canada. motorcycle Ride for Redress. Mr.
government's unilaterally imposed redress settlement in 2006. 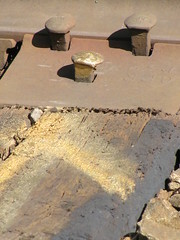 This entry was posted in Main Page on November 6, 2010 by Todd.